This is New and it is Huge! Everyone is doing it and now LeadBoxTexting makes it easy and efficient for you to do it too. Collect cell phone contacts, send text messages and appointment reminders. Create a mobile coupon and text it to your prospects, announce your amended business hours during winter storms. This web based easy to use program does it all. The bonus-use it on all your advertising materials, not just your lead boxes. 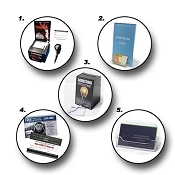 We create several displays to maximize your opportunity to collect leads instantly and easily. 250+Million Americans carry mobile phone -80% if the nations population. Between the ages if 12-45 will send 60% or more text messages than make voice calls. While 65% of emails is spam, less than 10% of SMS text messages is spam. Text messaging in the US hits 4.3 billion SMS every day. Americans spend more than 4.5 hours per month browsing on smartphones. Over 95% of text messages are open. Automated New Member/Client Alerts Automate a series of text messages over a selected period of time to welcome and communicate goals with new clients. Automated New Prospect Alerts Automatically keep an open dialog with prospects via text message with a series of text messages designed to convert your prospects to clients. Automated PT Appt. Reminders Schedule Any Appt. with an automated message to be reminded via text. Automated Renewal Reminders Automatically remind members ahead of time via text that their membership is expiring and how to renew. Send Monthly Updates on Products and Services Automate SMS fitness tips to keep members engaged in their workout program and your club.